On the Colectica ribbon tab, click the Document Workbook button. After clicking the Document Workbook button, Colectica will embed information in your workbook to document your data file and each column. You can add more detailed information by following the steps below. On the Colectica ribbon tab, click the Data Documentation button to ensure the Data Documentation pane is visible. Use the Dataset Details tab in the Data Documentation pane to add information about your data file. If you add or remove columns, click the Refresh Documentation button in the Dataset Details tab. 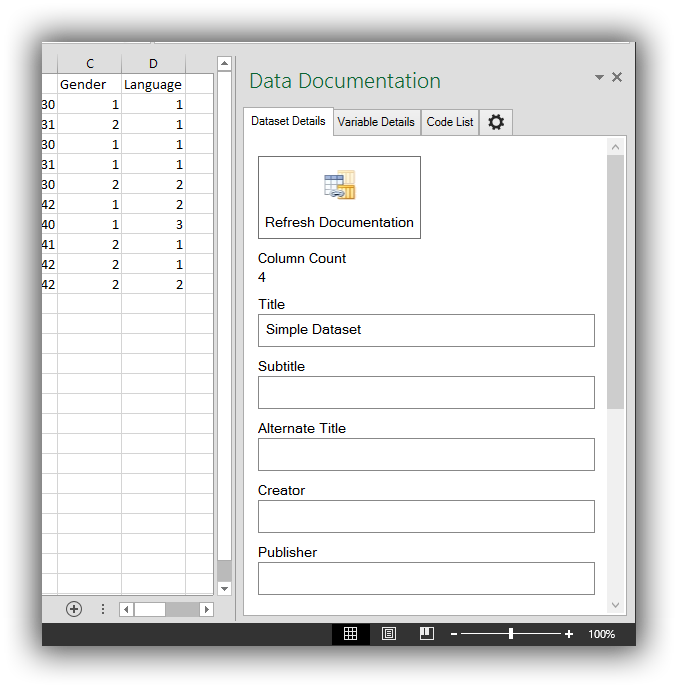 The Refresh Documentation button will attach documentation for any new columns you have added, remove information for any deleted columns, and update column names within the documentation.